Mkpurokwu Igbo, the online Igbo dictionary, defines ‘nzuzu’ as foolishness; stupidity; idiocy; folly. And it is to this word that I instinctively turn to in my quest to find an apt description for the level of adult delinquency that seems to have taken over the land. Nzuzu, more than any English translation of it can muster, describes what we know in local lingo as ‘mumu’; an absolute failure of reasoning; a refusal of persons who should know better to act in a way befitting of their status; a complete disconnect from the realms of sensibility. This state of existence seems to have plagued our country in recent time. How else do you describe the show of shame that is the recent (and ongoing) Nigeria Governors Forum (NGF) election debacle? To be frank, I have held myself from commenting on the development because it will amount to helping to legitimise illegality. The NGF is at best, a men’s club peopled by individuals who are fed fat off our collective patrimony. It is not a democratic institution, a tier of government, political party or a civil society group. Its activities to the extent of its unconstitutionality should (like say Ikoyi Club or Peoples Club) be the business of its members and should not disturb the peace of others. I have long held that the group was a distraction to the polity and a derailing of the democratic process laid out clearly in our laws. However, their recent election developed somewhat into a national fever, and the failure of 35 grown men, all educated to at least senior secondary level as provided for by the laws; all leaders and sworn defenders of the constitution; all supposed advocates of free and fair election, has made it incumbent that one comments on them. And I shall not waste too many words in doing so. 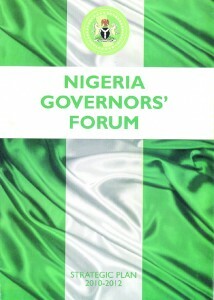 Members of the Nigeria Governors Forum are simply ndi nzuzu. And while these governors relocate to Abuja, holding nocturnal meetings in various venues, buttressing what faction they belong to, and wasting tax payers’ money deliberating on matters that are outside of what their mandates prescribe, their states groan under the weight of neglected problems and unfulfilled promises. Among these governors are the eleven whose state teachers are currently on strike over an issue that is so embarrassing that it should be talked about in hushed tones. It is bad enough that this country has over the years abused its teachers; and in the process, mortgaged our destiny as a people; but the governors of Cross River, Ebonyi, Ekiti, Ogun, Edo, Kogi, Niger, Borno, Benue, Zamfara and Sokoto think dragging the system a little lower will be cool. Almost three years after the modest 27.5 per cent enhanced teachers salary scale was negotiated and agreed on (with the governors), these states have not paid a dime while some others have re-negotiated it or implementing sparingly. It is instructive to note that Edo State, led by an erstwhile labour leader and controlled by the opposition, is one of the states. And while they pick their tooth with our misery, the teachers in those states sit back at home and the pupils, the future leaders, help themselves to whatever malfeasance the streets can teach them. If you thought nzuzu was limited to politicians, then you must think again. Nothing better describes the happenings in the Ahiara Catholic Dioceses but fully fledged nzuzu gradually tending towards madness. In case you are yet to hear, some people of Ahiara, better known as Mbaise, in Imo State, have rejected the new Bishop appointed by the Vatican to lead the diocese following the death of the erstwhile Bishop, Victor Adibe Chikwe, for no other reason but for the fact that the new Bishop is from Anambra State, and that they want one of their sons to be ordained. Any right thinking person will feel both anger and embarrassment that any group of people, under any guise and for any interest, will utter some of the words I have read in newspaper articles and paid advertisements. This descent into nepotism and promotion of clannish exclusiveness, even in matters that are spiritual and guided by laid down rules, reminiscent of the agitation of local communities where federal universities are domiciled for their sons to be made vice chancellor, is disappointing and worrying. The fact that clergy and some lay faithful, many of them very educated people, will descend so low tells you how much in trouble we are as a people. One such character is Dr. Onyema G. Nkwocha who wrote from the USA advertising his nzuzu here, boasting of how the Mbaise people have collectively prevailed against injustice. I wonder what he teaches his children. Another one, a professor vomits his own bile here. I am not sure what exactly it is he professes. I wouldn’t know what side of the bed former military ruler and serial presidential candidate, Muhammadu Buhari, woke up from the day he granted Liberty FM Hausa Service his latest interview but it is apparent it was not the good side. I have read the report of the said interview a number of times and I am forced to plead the excuse of senility as the only justification for his utterances. Nothing else explains it. That any Nigerian, especially a top figure of his status who had witnessed the carnage by Boko Haram who many have repeatedly called upon to take categorical steps to support efforts to end the insecurity, to so publicly condemn the emergency rule in parts of the north and attempt to juxtapose it against the Niger Delta militancy; and betraying in the process, such narrow tribal tendencies, is not just disappointing but also unbecoming. It must be said. And while we are still at it, I hear the Super Eagles who have an all important world cup qualifier against Kenya in Nairobi will not be arriving Nairobi until few hours before kickoff; and this if after long flights from Texas to Germany and then to Addis Ababa. Anyone who has the remotest knowledge of professional football knows you cannot do a good job of it when you are fatigued. The eggheads in the Football House don’t think so; or perhaps while they made the travel plans someone did not get his time difference calculations right. Whichever it is, some high level nzuzu at that level has gifted Coach Stephen Keshi a readymade excuse for any bad result. I end this tirade with a sigh. May God save us from us. First published here on 5th June 2013. PS: The Kenya vs Nigeria match has been played and Nigeria thankfully won by a lone goal.